The following is a reprint of the Chambersburg Public Opinion 1970 newspaper article. SHIPPENSBURG – Evening shadows faced into complete darkness as a seasonable chill embraced the night air, and hinted of approaching winter. A woman stood patiently at the station’s door and eagerly watched the approaching train grind its way to a stop. That was during the winter of 1922. A short time earlier a delegation of prospective bandsmen visited the rehearsal of the Newville Band, which Smith had organized, to watch him direct… to see if this man would consent to take on yet another project… one that would play a most important role in Shippensburg hisotry. Shippensburg had earlier bands. The Edward Shippen Military Band was organized on Oct. 24, 1910, and incorporated on Christmas Day that year. Before the Edward Shippen Military Band, the Walter C. Snodgrass Cornet Band presented concerts and marched stiffly in local parades. THEY KNOW MUSIC — Clarence Smithe, left, 88, Carlisle, who helped the Shippensburg Band organize, and Professor Ralph Schecter, band’s performances, talk over old times. Professor Schector founded the Harrisburg Symphony. From the time Clarence Smith stepped from the train from Carlisle, music in Shippensburg entered a new era. Practice after practice was held, membership grew to 33. Then he formed a beginners’ class which grew in size to challenge the senior band. The next step after getting the support of the citizens was a campaign to include the band among the recipients of the newly-created Community Chest. Gordon Hargelroad, cornet soloist, played “The Holy City” during the Nov. 30 concert in 1930, in Memorial Lutheran Church chapel. The following summer, during a sacred concert at the city playground, Blaine Brown performed the same solo on his cornet. The Municipal Building was selected for the next concert in celebration of the 19th anniversary of the firing of the final shot the World War, on Nov. 11, 1918. Such favorite war songs as “Keep the Home Fires Burning,” “There’s Something About a Soldier,“ “Pack Up Your Troubles in Your Old Kit Bag” were enjoyed by the audience. For the celebration of the birthday of Victor Herbert, a composer whom Conductor Schecter had personally met, the band used for the first time, a tympani borrowed from Shippensburg State Teachers College. Band members were rewarded with new “modern blue and gold design” uniforms, following several fund-raising concerts in conjunction with the Shippensburg American Legion. 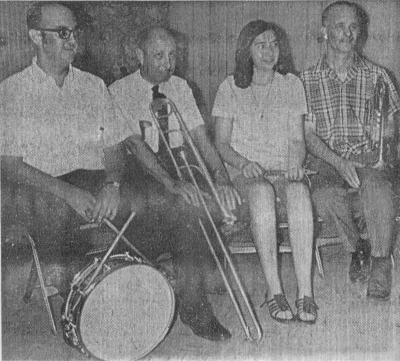 As a way of showing appreciation, the group presented a special concert dedicated to the donors, the state teachers faculty, Dr. Curry, Vigilant Hose Co., Wilber Goodhart, Lions Club, Cumberland Valley Hose Co., Knights of Pythias, Rotary Club, Hub City Club, Civic Club and the News Chronicle. SHIPPENSBURG BAND OFFICERS — Heading the Shippensburg Band are, from left, president, Karl Thompson; business manager, Howard Sheeler; secretary, Jane Seibert; vice president, Dale Starry. Absent when photo was taken was Jack Frey, treasurer. It was in January 1940 that the Shippensburg Band played a part in boosting the repair fund for the popular town clock. Ira Crusey headed the drive, saying that $400 was needed. 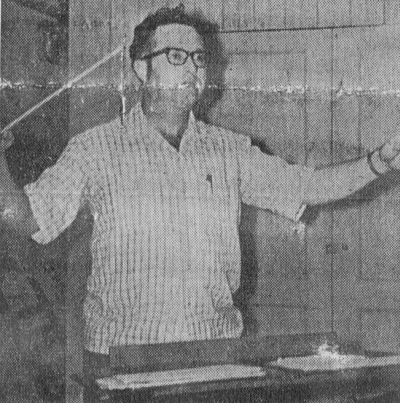 Then George E. Mark, of the Shippensburg State Teachers College faculty, mentioned lighting the clock’s faces. “The town clock has become a part of our life. We see it all day long, and hear it day and night, but we never see it at night. Now it has been suggested that we install lights on the clock so we who get home late won’t have to bother to take out our watches,” he said. The band scheduled a specia fund-raising concert. Naturally, what other piece would be more appropriate than “Grandfather’s Clock,” among the selections. The clock, atop the steeple of Shippensburg memeorial Lutheran Church, continues to try to keep Shippensburg residents aware of the correct time. It is not to be thought that the Shippensburg Band was just a concert band. They were gaining popularity in parades as well. It is humorous to note that during the fireman’s parade in the summer of 1950, the judges’ report criticized the trombones… “Too strong and blasting”… “Several members wore tan shoes,” and “One man was out of step.” Nevertheless the band placed third with 84.75 points, the highest being 89.1. The Shippensburg Band continued weekly practices, scheduled concerts, competed in parades. Its support grew with each new year. Enthusiastically, new members joined, some withdrew, many stayed on. Shippensburg had learned to depend on the excellent musical organization for any occasion. Kenneth Slater succeeded Professor Schecter as director until 1966, when Donald Bollinger, Aspers, agreed to assume the leadership. Nineteen hundred and sixty-nine was another busy year. There was the “50 Years of Music and the American Legion” concert, the Ascension Festival and the memorial service at Solders National Cemetery, Gettysburg, headed by Grand Commandery Knights Templar of Pennsylvania, with Shippensburg’s Charles R. Eurich, as grand generalissimo. The most recent concert was in April this year when, in the junior high school auditorium, Lincoln B. Fogelsanger and Miles Cowdrey were soloists, playing “Concert for Two Trumpets.” It should also be mentioned that each Memorial Day, the Shippensburg Band carries a heavy schedule, marhcing in not only the local parade, but hose in neighboring towns. Professor Schecter recently voiced praise for two bandsmen in particular, Howard Sheeler and James Hockersmith, for playing a tremendous part in keeping the organization active. Smith proudly added that Hockersmith was in his first beginners’ class in 1925, and he is still a most active member. The originator of the Shippensburg Band also organized the first Shippensburg school band in 1929, just one of his many musical accomplishments. 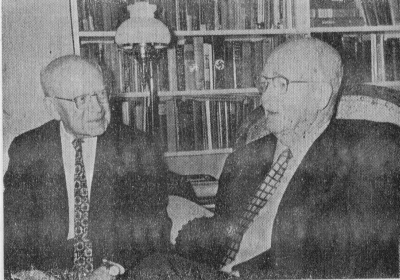 Both Professor Schecter, who founded the Harrisburg Symphony, and Smith, reside in Carlisle. Professor Schecter is 77 years of age. Smith, an active 88, is playing bass clarinet regularly with the Carlisle Band, the Shrine and the Tall Cedars bands of Harrisburg. Although small in number, the Shippensburg Band has the “Big Band” sound. Shippensburg should be proud of this fine group whose main objective is to willingly serve the community in creating a desire for good music, encourage the study of music among its members, promote community fellowship at all holiday functions, and to promote a cooperative atmosphere between it and the public school music organization. Rehearsals are held every Tuesday night in Central School, with business meetings scheduled monthly. The annual meeting features election and installation of new officers. Membership is open to any person musically capable and willing to abide by a set of bylaws, and approved by the board of directors. Auxiliary memberships are granted members of other musical organizations who wish to sit in on rehearsals and engagements, although no member of the high school band is admitted as a full-fledged member until he leaves the school band. Until then he must consider public school activities his first obligation. Aside from the neat Shippensburg Band Banner, carried by two attractive young women, and the baton-twirling, high-stepping majorette, the band is easily recognized … a band president in the front row plays trombone, a tax consultant and a grocery store owner beat drums, a psychiatrist with dark sideburns marches with his cornet, a popular junior high school teacher puffs on his bass horn, and, if he doesn’t have another commitment, a tall high school band director steps by with his trumpet. These are only a few of the large variety of occupations held by the bandsmen. Add several college students, Letterkenny Army Depot workers, college faculty members and a sprinkling of teenagers, and they equal the proudest, most enthusiastic band in the valley. They rightfully deserve every compliment paid them, while marching and in concert. Lincoln B. Fobelsanger, Miles V. Cowdrey, Ralph Coover, Karl Thompson, Mona Brown, Leslie and Jerry Dubbs, Joel Zullinger, Frank Weaver, Jim Wynkoop, Valinda North, Elmer Ott, Mr. And Mrs. Glen Richard Perry, Sam Gehrett, Donald Bolar, Larry McCurdy, Robert McCann, Jack Frey and Walter and William Gehrett.